Where: Meet outside Artist Robert Jones' installation on the corner of John and Boren. In celebration of each round of Storefronts installations, Shunpike is hosting an art walk where participating artists and the public get together to view and discuss the installations. The art tour takes about an hour total - each Storefronts artist will talks for 3 minutes about their work. This is an informal outdoor event! Nigerian-American artist Jite Agbro brings a selection of her latest work to Seattle Central's M. Rosetta Hunter Gallery. 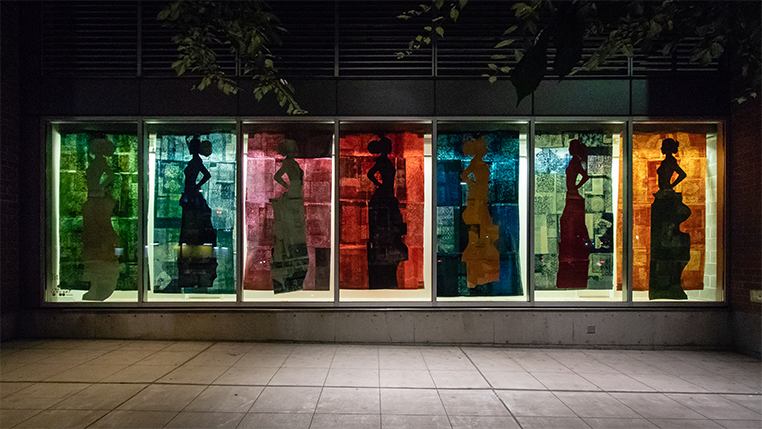 Armor is a collection of large printed, wall hangings, and paper sculpture that explore how we as human beings project ourselves and our identities into the greater public space, and how doing so changes the way we see ourselves and others. Inspired by personal experience, travel, and the global political climate, Armor visually expresses not only the superficial markers of status, but also the silent exchanges between individuals and groups. Negarra A. Kudumu | essayist and curator will present its fifth by Seattle-based artist Jite Agbro opening November 30, 2017 and running through January 6, 2018.